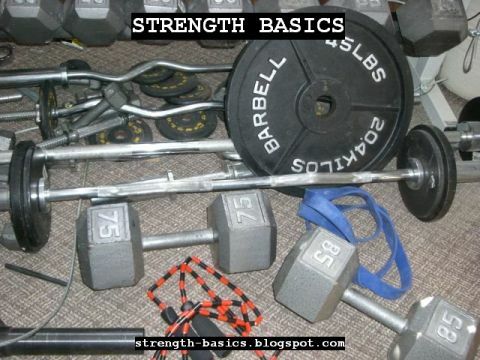 Strength Basics: Bad Exercise, Bad Trainee, or Bad Combination? There are no bad exercises, there are just exercises that are bad for some people. The idea is simple - no exercise is bad. No trainee is bad. But some combinations are bad. For example, an overhead press. If you have proper shoulder mobility (your shoulder moves correctly), it's a fine exercise. If you have proper shoulder stability, it's a fine exercise. If you lack one of those, it's going to be a potential problem. If you lack both, putting a bar overhead is going to be a serious problem. The more weight on the bar or the faster you move it, the more serious the problem. Another example is a sled push. It's a simple exercise, and almost everyone can get into position for it and do it well. But some people get dizzy in a head-down position, or even just when tilting the chest and keeping the head up. For those people, pushing a sled - especially with low handles - can be risky. Do these make overhead presses or sled pushing bad? Does this mean those exercises are contraindicated for some people? Your own history can change what's a useful exercise. Good hips, good knees, and no history of back pain? Heavy deadlifts are going to do you some good. Hip problems or some fused vertebrae in your lower back that are never 100%? Spinal loading isn't a good idea, and you can't risk flexing under a load, so heavy deadlifts aren't, either. I used to be able to press behind the neck with no problems - in fact, it always felt good. Several arm dislocations later, though, and my shoulder lost the stability to do it. But I have clients who went from "can't stand up without pain" to "can squat to a low box under load without pain." Injury or adaptation can change the risk:reward of an exercise. They can also change your ability to do it or not. Could I regain the shoulder stability to press that way again, or my clients lose the ability to squat low? Yes. Ability to move isn't fixed, and you have to work to retain it or improve it. Are there really no bad exercises? There are exercises that are mostly risk, with little reward. Juggling kettlebells is very cool, but it's more of a demonstration of strength than a low-risk way to build strength. You probably want to save that one for the strong and agile, rather than use it to get there. Some exercises are just poor compared to other options. Triceps kickbacks are an okay exercise, but there are many other potentially better options. Some seem to be risky for almost everyone - barbell upright rows put the shoulder in a tough spot for almost everyone. Do that repeatedly under load and you're potentially getting injury instead of improvement. Some exercises are great for one thing, but not for others. For example, squatting on a Bosu ball or on a block of foam is not a great exercise for strength. You are limited by the instability of the platform, and therefore you can't lift as much weight. You are limited by your ability to compensate for the unstable surface. That's great if your goal is to build up that compensation. It's not great if your goal is maximal strength, endurance, power, or technical skill. Short version: Some exercises will be bad for you. And some exercises are bad for your goals. You want to choose the lowest risk : highest reward exercises for your body and your goal. With those things in mind, yes, some exercises are "bad." Not for everyone, but for you. Or just bad for your goals.